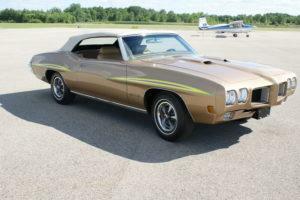 It is generally accepted that in 1970 Pontiac made 12* GTO Convertibles equipped with the Ram Air IV (WW) engine and the 4-speed Muncie transmission. What is left to conjecture is how many of them still exist? At this writing, the speculation is that there might be only 2 or 3. What we do know for sure is that one of them is in the Ken Nagel Collection. 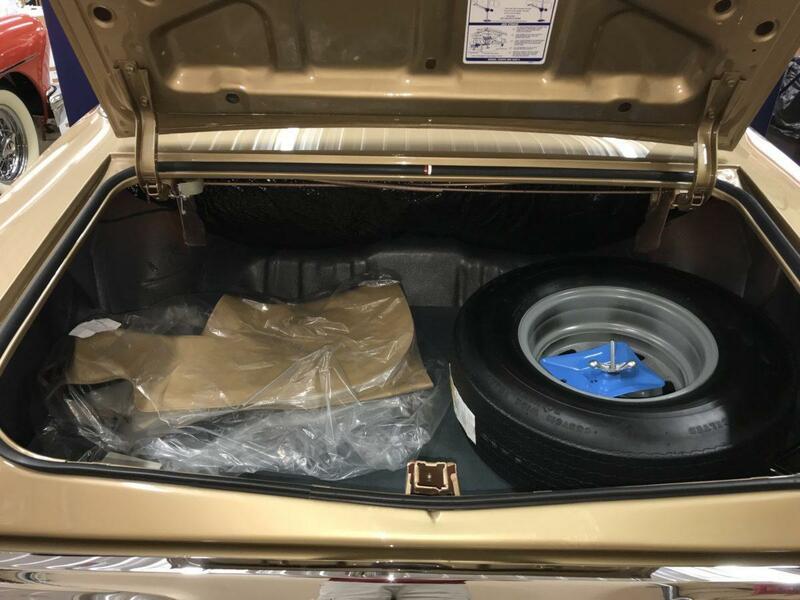 How many of the 12 were ordered with Palomino Copper** paint, Sandalwood soft top, body accent “Judge” stripes (option 422, $26.33) and the Spring-Shocks Ride/Handling package (option 621, $4.21)? No one really knows that either. Not many, that’s for sure. 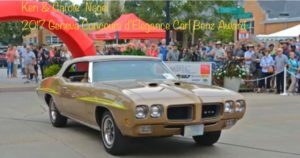 A question that often comes up at car shows is “what’s the difference between a Ram Air IV GTO and a Ram Air IV GTO “Judge”. The answer is, not much. The cars were identical except for the “The Judge” package. 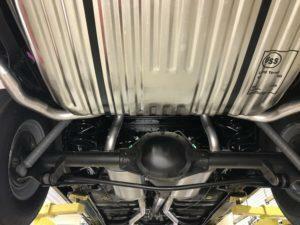 The build sheets for both cars will list “4 BBL R/A IV” (option # 347, $558.20) as the engine option. When the Ram-4 engine option was installed in any GTO, handling & drive train upgrades were automatically included. 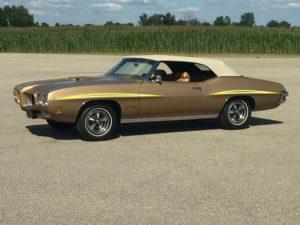 The special “The Judge” package, (option #332 at $337.02) available on all GTO’s, consisted of a Ram Air III engine and an appearance package that included Judge decals, Hurst T-handle shifter, rear spoiler, black wall G70 x 14 tires, "dechromed" (no trim ring) Rally II wheels and a blacked out grill. If a customer cared more about GO than SHOW, they would simply order their GTO with the Ram Air IV engine and save the $337.02 ($2182.48 in 2017 dollars). The strikingly elegant appearance of Ken’s GTO masquerades the brute power of the grossly underrated Ram Air IV engine and close ratio 4 speed. Only the Ram Air IV decals on the hood and the “eyebrow” fender stripes give any hint of the performance capabilities of this rare and unique automobile. Factory rated at 370 HP, Ken’s GTO dyno tested at a heart pounding 436 HP. 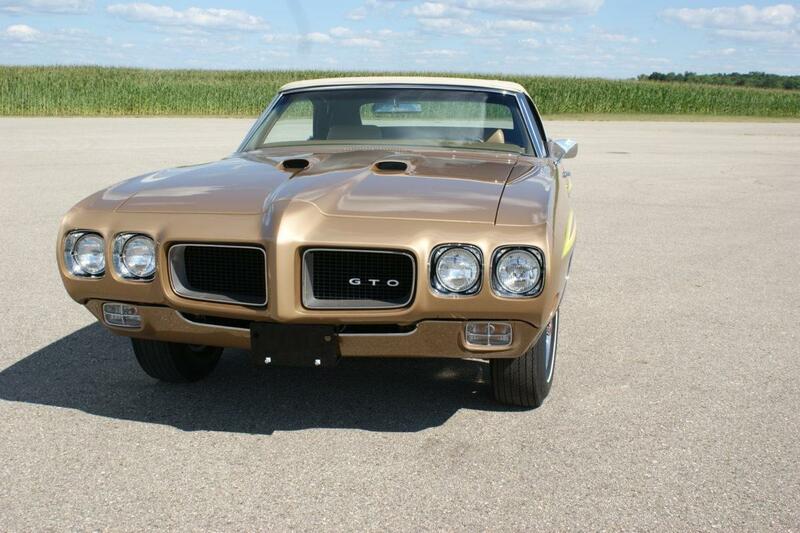 “For People Who Think Driving Should Be Fun…” was the headline on the GTO sales brochure for 1970. That catch phrase certainly applies to Ken Nagel. Ken let it be known that he was in the market for a Ram Air IV GTO convertible to sit beside his ‘70 LS6, ’69 Oldsmobile 4-4-2 W30 and ’68 Shelby GT 500KR convertibles. In the fall of 2015 Ken located a rust free, largely intact RA-4 GTO that had been sitting in a warehouse for a number of years. 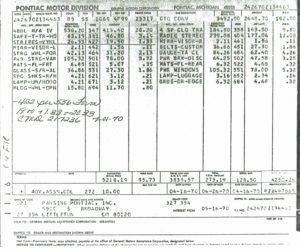 After extensive research produced a PHS build sheet and paperwork going back to the original owner that authenticated the car, Ken made the purchase and subsequently commissioned a comprehensive restoration. On July 27, 2017 After 18 months in the shop the now pristine GTO was delivered. 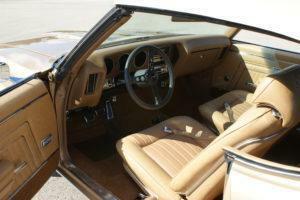 The background, history and paperwork on this car are complete in every detail, going back to the original owner. The car was ordered new from Pansing Pontiac in Littelton CO by Jordan Primack. We were able to interview Jordan along with others who were associated with the car for its entire history and record their recollections. It was assembled at the GM plant in Fremont, CA sometime between April 4 & 11 1970. Delivery to Pansing took place on March 16, 1970. Jordan and his friend Laurence Rich, were into fast cars back then. 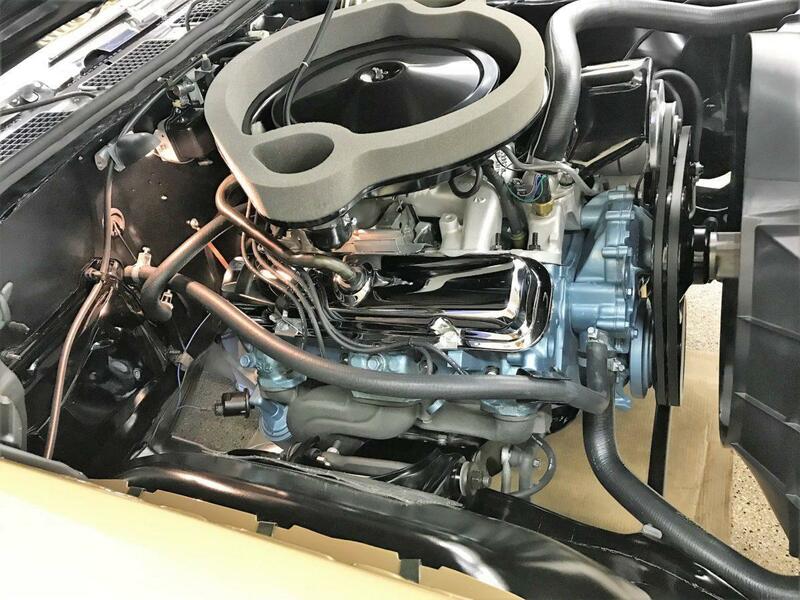 Larry bought a 1970 455 HO GTO that he still has, at about the same time Jordan bought his Ram-4. Jordan and Larry were kind enough to be interviewed about the history of the Ram-4. Turns out Larry was working his way through law school at Pansing Pontiac and remembers the car well. Jordan said that his wife drove the car to and from her job. He was a contractor and mostly drove his pick-up truck. Jordan, who is now a successful real estate developer, still has a photo of the GTO on his desk in his office. He graciously agreed to send us a copy. The photo shows the car doing a speed run on one of the county roads outside of Denver. He said it would do quarters in the 13’s at Denver’s 5,000 ft. altitude. As Jordan’s family started to grow, he wanted to trade it back to Pansing for something more “sensible”. But in 1973 there was no demand for a convertible with a stick shift and thirsty engine, so he sold the GTO on October 29, 1973 to John Patrick Dickinson a friend, who lived in the neighborhood. 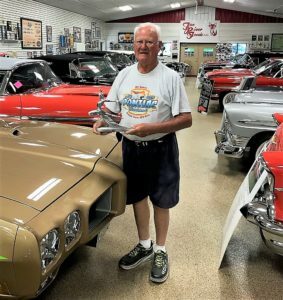 John kept the car for 42 years until he sold it to Ken Nagel on November 10, 2015. 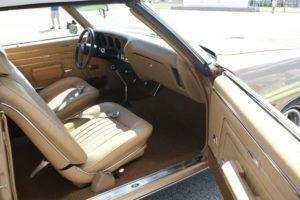 Now, 42 years later it was in the restoration shop. When it was dismantled it was found to be intact. 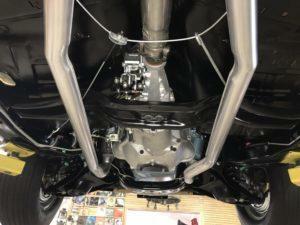 All the pieces were in place and the body and chassis were in great condition. 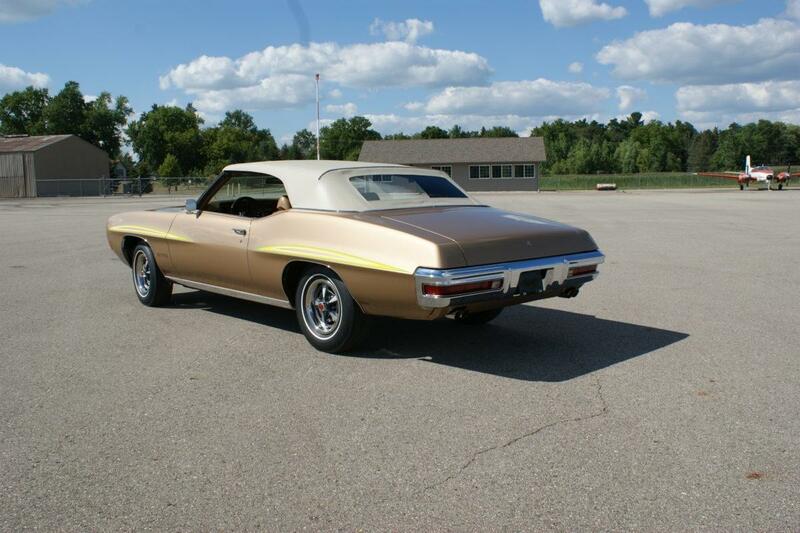 The GTO was painstaking brought back to build sheet specifications. 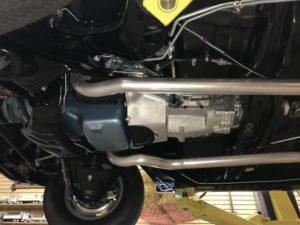 The chassis and suspension components were refurbished and new bushings and joints installed. The original drivetrain was overhauled and the original heads, manifolds etc. were installed on a service replacement block that replaced the one that suffered a freeze crack. 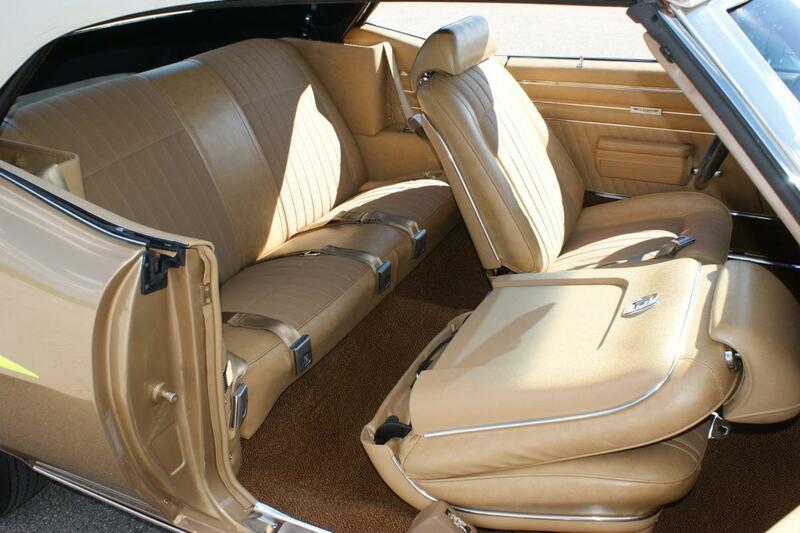 The interior upholstery was replaced with new old stock material. 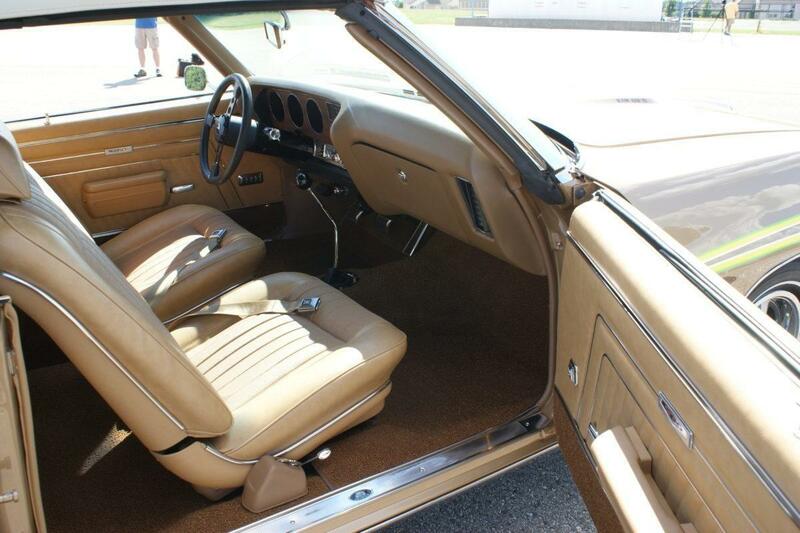 The Palomino Copper paint was accurately matched to the original 1970 finish and laid over the original sheet metal. 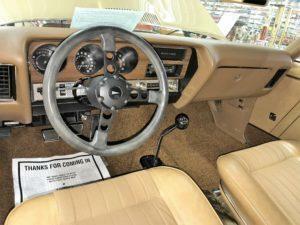 Everything on the finished restoration from the glass, steering wheel, to those famous round-port heads was original to the car. 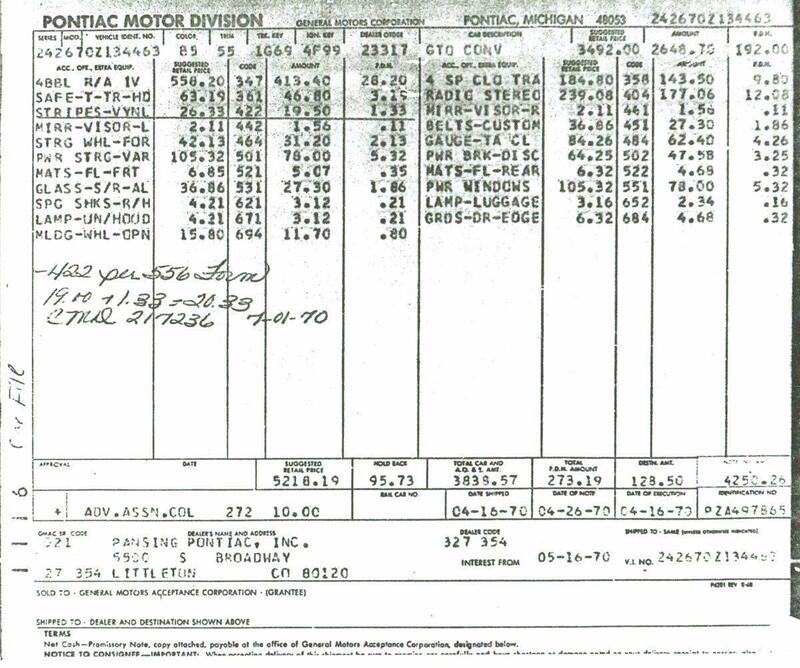 A few NOS replacement parts were needed to make the car identical to the 1970 build sheet. The Pontiac V8 engine evolved into one of the finest performance powerplants ever inserted into a production car. 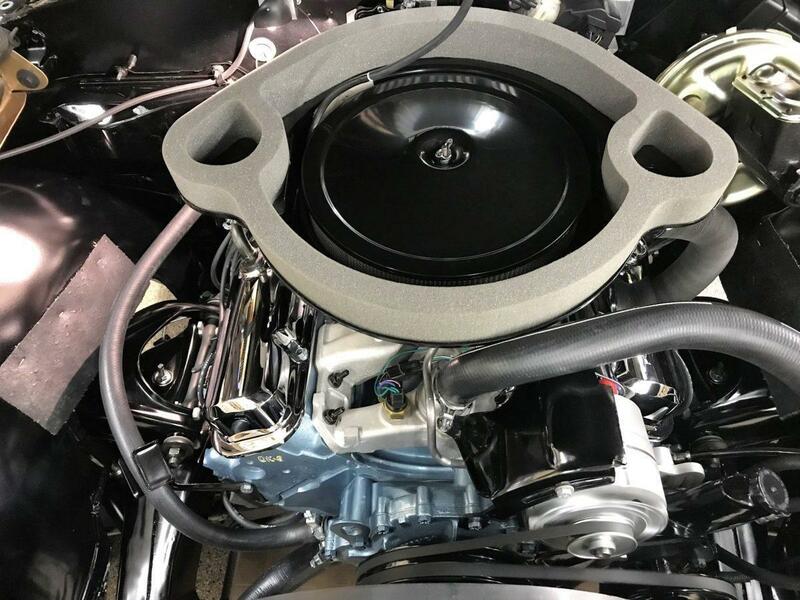 Special engineering for the heads, pistons, cam, crank and the Ram Air induction system combined to produce a “beast” in the beauty. 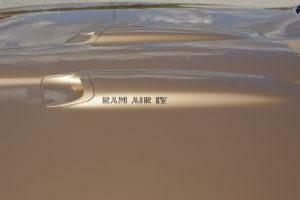 The 400 Cu In Ram Air IV was the culmination of years of performance V8 development at Pontiac. Underrated from the factory at 370 HP at 5,500 rpm and 445 lb-ft of peak torque at 3,900 rpm, the Ram Air engine idled roughly and took some doing to drive at low speeds. It was an engine meant to be raced not driven delicately. Today, any high-compression round-port Pontiac RA IV is highly sought after due to its low production numbers and superior performance on the street and at the strip. 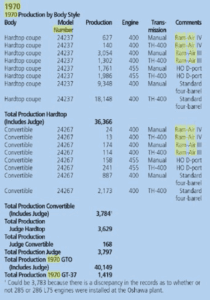 After RA IV production ended, Pontiac continued using its round-port cylinder-head design thru 1971. 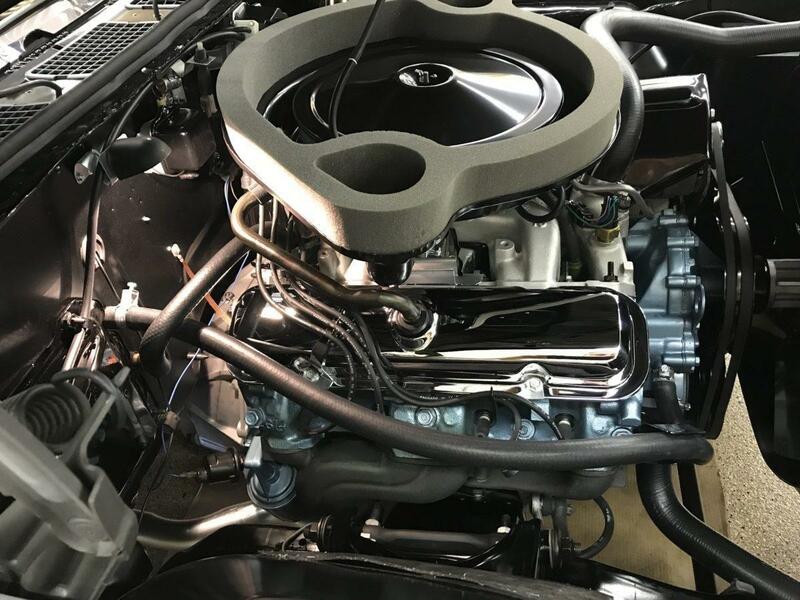 However, by this time compression had dramatically dropped off, marking the beginning of the end of the muscle car engine. The sturdy WW block used 4-bolt main caps, forged pistons and a 60-pound oil pressure relief spring. A radical high-lift, long-duration camshaft bumped limited-travel hydraulic lifters, 11/32-inch pushrods and HD valve springs. 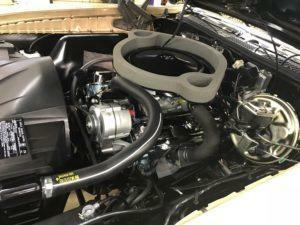 10.5 compression round-port cylinder-heads, 1.65:1 rocker arms, aluminum intake manifold, header-like high-flow cast-iron exhaust manifolds were topped off by a sealed air intake system that featured twin hood scoops manually operated by a knob under the dash. 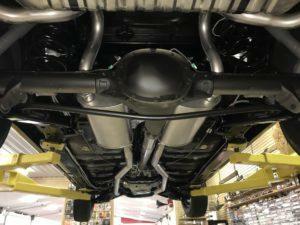 This set up supplied “Ram Air” to the Rochester Quadrajet 4 bbl. 750 cfm carburetor. 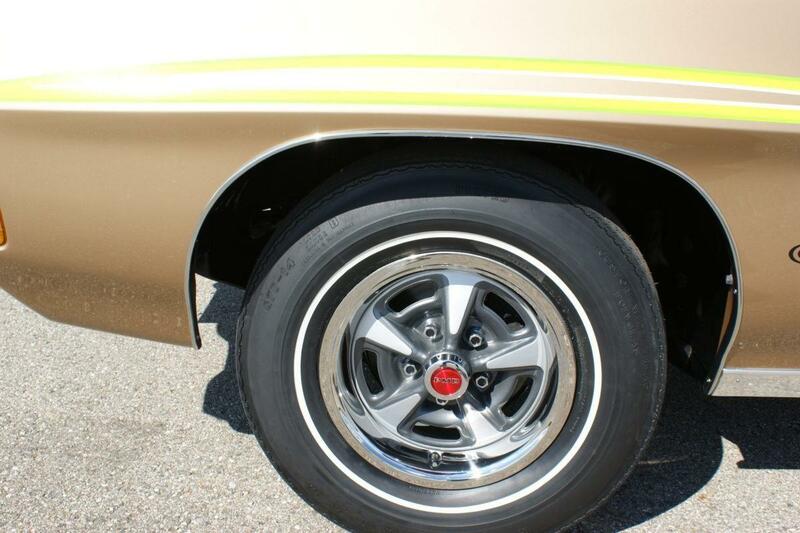 The GTO’s superior power and driveline were matched by special suspension and brakes, making them among the best-handling muscle cars of the era. 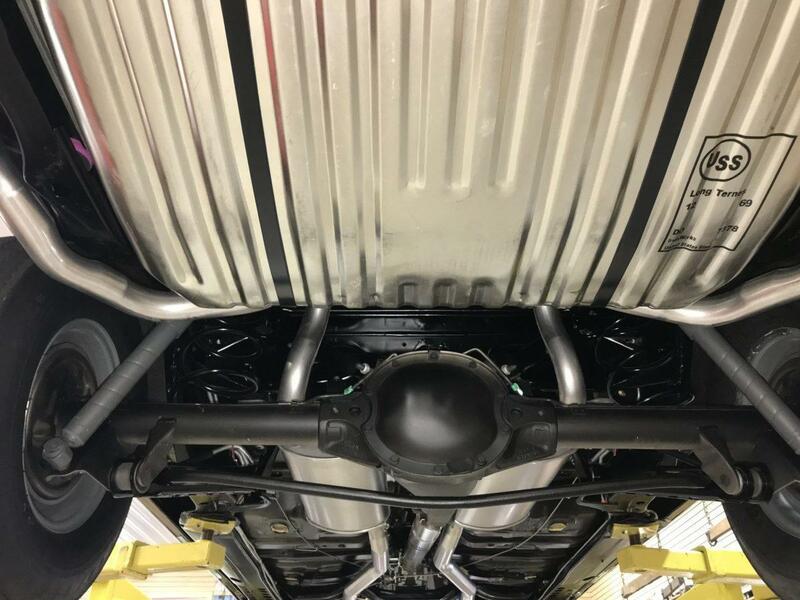 The “Ram” in the Ram Air system came from feeding cooler, denser outside air into the engine from twin scoops on the hood's surface. 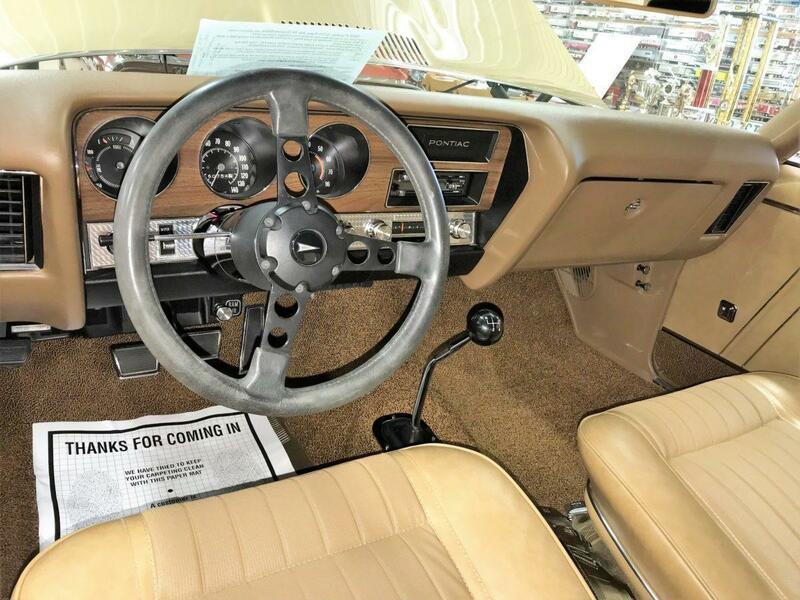 The Ram Air system was driver-controlled by a push/pull knob under the dash. The driver could close the air inlet valves (flappers) in the scoops during inclement weather or whenever they wanted to turn off the “Ram” feature. 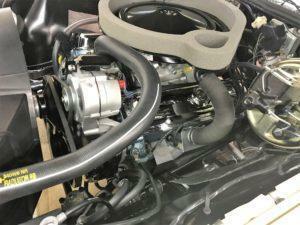 Doing so also opened a valve to allow the engine to breathe dry filtered under-hood air. The system also incorporated a vacuum-actuated thermostatically controlled valve that blended preheated air fed from a tube on the driver-side exhaust manifold with the intake air to aid engine warm up, idle quality and cold weather drivability. Once the engine was up to operating temperature, the air inlet thermal sensor caused the air heat valve to close. So, when the scoops were open, only cool outside air was delivered to the carburetor. When they were closed, only under-hood air was provided. Making the system work required some complicated engineering and hardware. 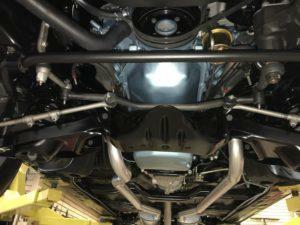 Major components consisted of two open hood scoops, air inlet valves and housing, baffle-to-hood seal, hood inlet baffle, air cleaner vacuum diaphragms, air cleaner lid and element, shroud (air cleaner base), baffle-to-shroud seal, air inlet thermal sensor and preheater-to-inlet shroud duct (tube). If there was a Mt. Rushmore for muscle cars the Ram Air IV GTO would be on it. For sheer beauty, grace and brute power it was unsurpassed. Looking equally stunning as either a coup or convertible, the clean sleek lines from the Endura bumper to the twin chrome dual exhaust tips made it the most stylish GTO ever. 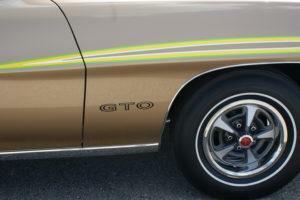 Some say GTO styling reached its peak with the 1970 model. It all came together in one shapely package. Evolving from the square, sharp edges of earlier models into a flowing sculpted silhouette that just plain looked great. Form followed function in a great whoosh! of speed and a roar of fury. In a day where nameless legions of designers sit in front of computers and spew out shapes like bland porridge painted in drab lifeless colors, names like John DeLorean Jim Wangers & “Pete" Estes are reminders of a Pontiac past when style stirred the emotions and powerful engines satisfied the need for speed and adventure. They were the artists, engineers and visionaries working in steel, iron and vivid colors who turned car guys dreams to reality and sold a lot of cars in the process. 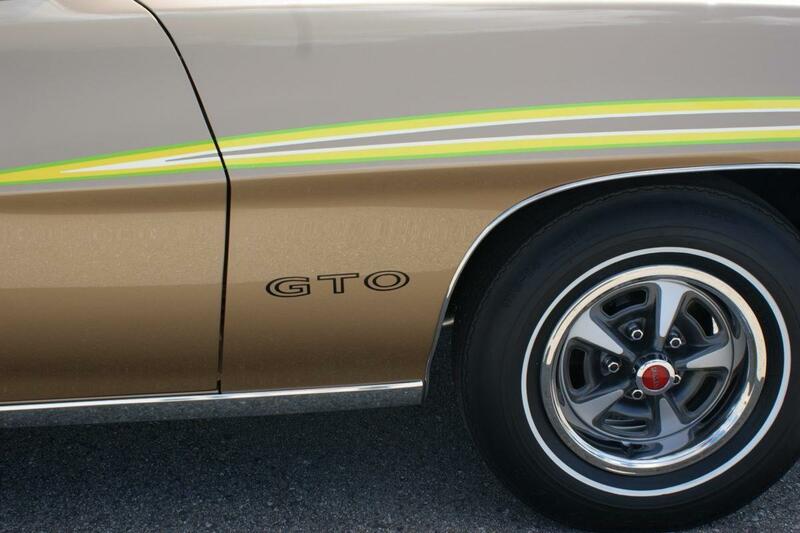 In a time when every kid on the block could name cars just by their shape, they were the rock stars of the auto world who gave us milestone cars like this GTO that would set the standard for style and performance for the next two decades. 1970 was a bittersweet time for performance car enthusiasts in America. Cars had reached never before seen of levels of horsepower, style and performance. Unfortunately, there were overwhelming forces at work that would cause “the muscle car era” to come to crashing down in less time that it took to arrive. The “gas crisis”, rising insurance premiums, Federal emissions & safety regulations and inflation-fueled "sticker shock" all combined to bring the era to a screeching halt. While these harsh realities plagued all cars, muscle machines fared the worst by far. They did, after all, have the most to lose. 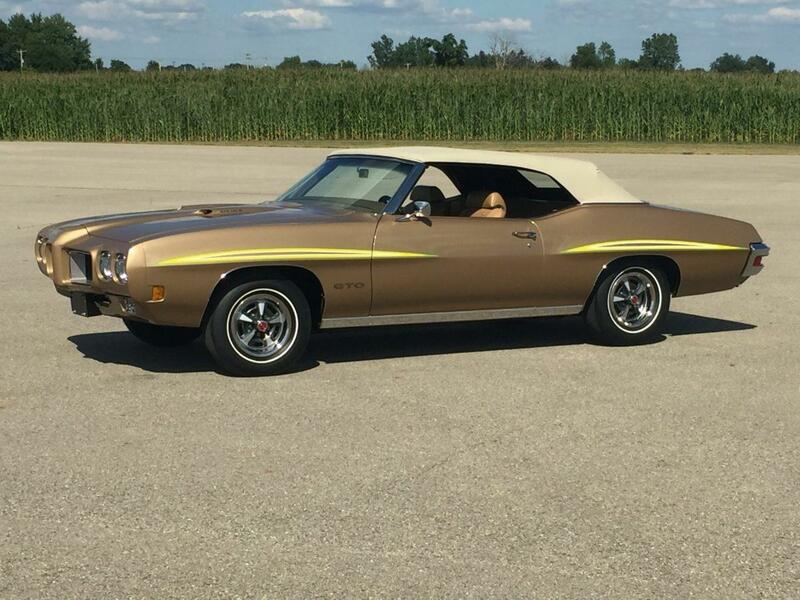 1970 proved to be both the pinnacle of muscle car development and the beginning of a 30 year decline in performance that would not see a resurgence until the beginning of the next century. 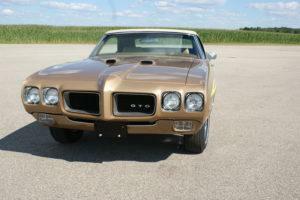 The “Muscle Car” era started with the 1964 GTO and it is fitting that it ended with the 1970 GTO. Unfortunately, it all ended for Pontiac when the last car rolled off the line in January 2010. The storied marque that was introduced by General Motors in 1926 was dropped because GM’s financial situation worsened due to the economic downturn of 2008. 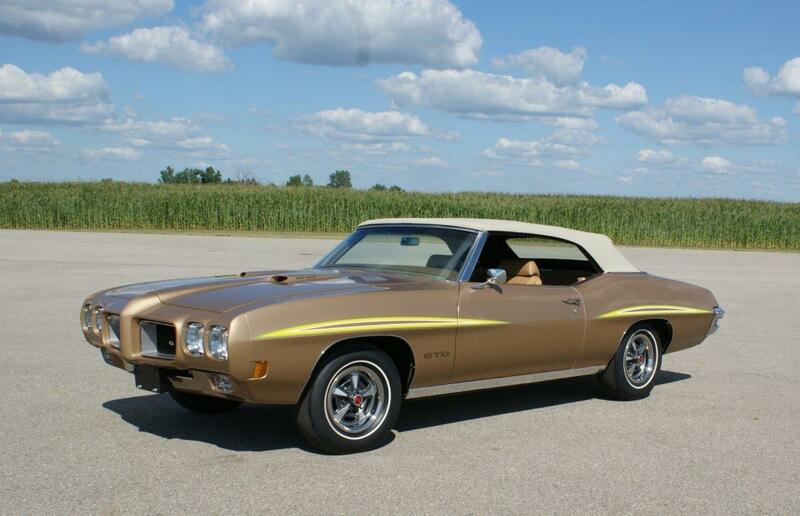 *In 1970 the Pontiac division of General Motors built 40,149 GTO’s of which only 3,784 were convertibles. 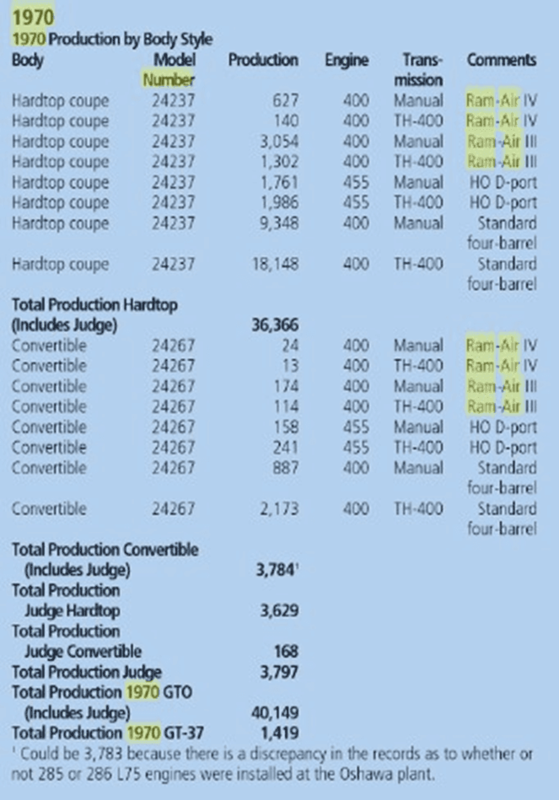 A total of 37 GTO/Judge convertibles received the 370 HP Ram Air IV engine. 24 of the Ram-4 GTO/Judge Convertibles received the Muncie four-speed manual transmission. 12 of the 24 GTO’s had “The Judge” option and 12 did not. **Only 1,457 (3.6%) of the 40,149 GTO’s were ordered in Palomino Copper making it the 4th rarest color.